This post is in response to Ken Newsome’s post, which you should read first. I like Kent Newsome, he’s always got tons of great stuff to comment on, I mean really, check his archives. 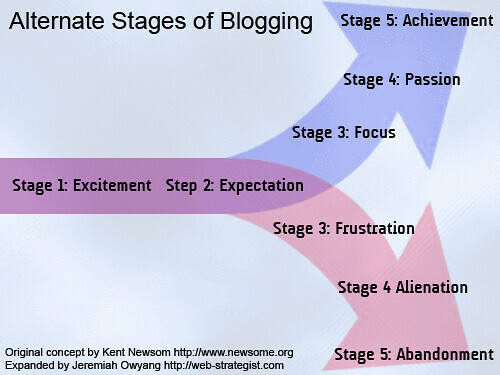 He’s got an interesting set of points about blogging that is true for the majority of bloggers out there before you continue on, read his piece From Creation to Abandonment: the 5 Stages of Blogging. I wanted to share some of the learnings that I’ve gone through in blogging since 2005, in hopes of helping others. Kent shows the disparity that one can have in the process of blogging, and the subvert tactics that a blogger may try to take out of desperation. I understand, but it’s key not to participate in those link farms, blog carnivals or other sub-standard methods, why? because everyone else is doing them. Passion can take place in a number of ways, from frequency of posting, to adding media, to writing with authority. Attend events related to your Focus, read the people in my Focus, and talk about your Focus. I think about my Focus area all the time, except when with friends and family. If you start to think about your focus all the time, and do everything you can to make it better you will start to get noticed, your passion will bleed through. Believe me, I had a lot of critics to my blogging activities, even people that had web careers that I would have expected to support me, I barreled on past them. Stay passionate, there’s so many great things that will come out of this, now on to stage 5. When your passion starts to bleed out of your blog, you’ll start to write and come up with solutions or ideas that no one else has. Start covering events in your Focus area and give attention to the individuals and companies in your market. Soon, they’ll start to invite you to events, the chance to speak, and then exclusives you can have on your blog. You’ll start to get more and more exclusives in your focus. If there’s one thing I can tell you it’s that: One thing leads to another and you’ll start to outbehave your competition. something small will lead to something bigger, then bigger, and soon you’ll be getting paid to speak internationally. Related: I recently had a 1 year blog birthday for this domain that you’re reading, I published all my stats about this blog in public too, and will continue to do so over time. I also used to help my former large company with it’s business blogging program, I published a bunch of tips, some of them are still good. Now I help other companies and individuals with their blogging and social media strategies.